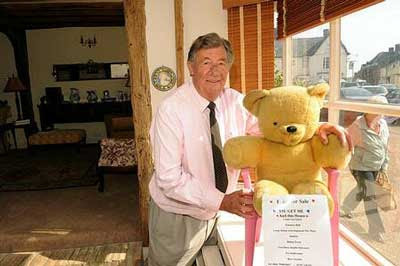 The nations most expensive Teddy bear has gone on sale in Suffolk - with a price tag of half a million pounds. But the buyer of the cuddly toy will also get the bear's home - a beamed cottage in Lavenham - one of the country's most picturesque medieval villages. The three-foot bear - which belonged to homeowner Walt McKinlay's daughter - is now in the window of the property with a "buy me" sign. Mr McKinlay, 73, a retired butcher and farmer, said: “It is time for me to move on so I decided that Teddy might help me sell the house. I have already had a lot of interest and a couple of viewings after property hunters saw him in the window. “He was originally given to my late wife by her parents and then our daughter Sadie had him but she is 44 now." The new owner will have to pay £495,000 for the Teddy bear and the 17th century property in the village's ancient market square. The former public house, now called Christmas Cottage, has also been a tea room and book shop and has two bedrooms and a small rear garden.